There are plenty of attractions, both natural and man made in Bundaberg. For a city its size Bundaberg has a lot to offer. Situated in East Bundaberg, the Baldwin Swamp environmental park is home to many species of birds and wildlife. Walking tracks, including boardwalks, enable visitors to visit the paper barked tea tree forest, vine scrub and eucalypt forest. The Bundaberg Botanical Garden is in North Bundaberg. 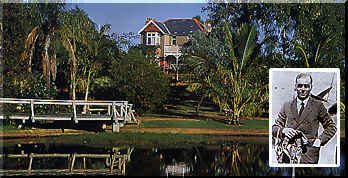 The centrepiece of the gardens are the lagoons where the young Bert Hinkler studied ibis in flight. These are now filled with water lilies and can be crossed on a boardwalk. The gardens have a mix of native and exotic plants. Without a doubt, Bundaberg's favourite son is Bert Hinkler In a brief lifetime of forty years, Bert Hinkler became one of the world's greatest pioneer aviators. His achievements are honoured throughout Bundaberg. Hinkler House Memorial Museum is housed in Bert Hinkler's Southampton home which he designed and lived in from 1926 until his death in 1933.The building which was under threat of demolition was dismantled and brought out to Bundaberg in 1983. Brick by brick the house was faithfully restored and now is an aviation museum situated in the Botanical Garden. 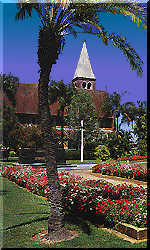 The Bundaberg &AMP District Historical Museum is also in the Gardens. A fascinating record of the district's pioneers and their lives awaits visitors to the museum. Fairymead House, built in 1890 and moved to it's current site in the Gardens almost 100 year's later, makes an imposing sight. It is now home to the Sugar Museum, a tribute to the sugar industry and the district's pioneers. The real flavour of Queensland can be found at the Bundaberg Rum Distillery in East Bundaberg, tours operate regularly throughout the year. Tropical Wines proudly make their wine from fruit, not grapes and you can taste and purchase at their North Bundaberg winery. Bundaberg Ginger Beer is very well known and a popular drink throughout Australia and overseas. As Bundaberg is relatively flat, the city's water supply gains its pressure from large water towers. The most interesting of these is the East Water Tower (1902) which is a masterpiece of bricklaying with walls up to 1.4 metres thick in places. It is not far from the rum distillery. Take in the finer things in life at the Bundaberg Art Gallery. Emmy's Cradle displays a wide variety of dolls. Close to the rum distillery is Schmeider's Cooperage and Craft Centre.